THE SKINNY: Yes, $25 is a lot to pay for an eyeliner. 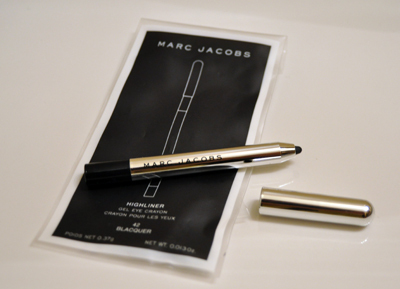 But Marc Jacobs Highliner Gel Crayon is worth the extra money. I traded in some Sephora points to nab a sample in black, and it's by far the richest and prettiest black I have in my makeup drawer. This eyeliner goes on smooth and is easy to blend. Topped with a little bit of shadow, it stayed in place all day, then rinsed clean with my usual face cleanser. The black is vivid, a lot darker and richer than my usual Urban Decay and Smashbox blacks. KEEP OR TOSS: Keep. It's gorgeous. Really. CHECK IT OUT: Highliner Gel Crayon comes in six colors. I'd love to try N(ice), a light silver with shimmer.